The Accessibility Committee is recognized for their dedication in seeing this project to its end. Shown here are Dorothy Webster, Doug Watson, Sheila Penney (Committee Chair), Dave Ward, Rev. Kelly Burke, Jim Merrill, and Allen Parlee. 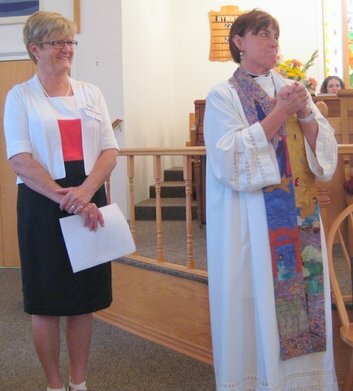 Board Chairperson Sue Morrison and Rev. Kelly Burke take part in the dedication service. 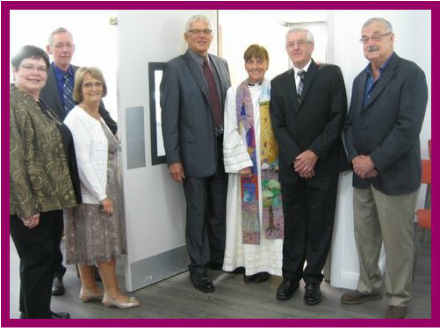 Sunday, June 12, 2016 New Maryland United Church had a special service of thanksgiving and celebration honouring the recent completion of our accessibility project and recognizing the Accessibility Committee for their dedication in seeing this project to its end. The expanded church enables us to enjoy a much larger space and at the same time allows all folks, including those who have mobility issues, to enjoy events at both levels of the church building with the addition of a new lift. 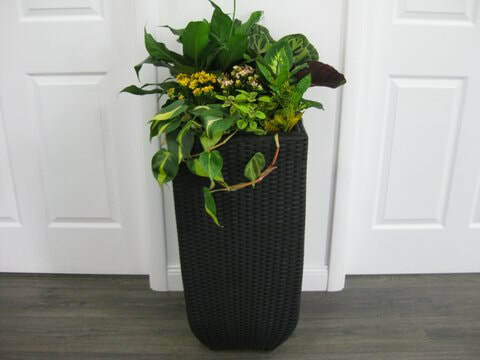 A plant arrangement containing seven plants has been placed in the upper level lobby. Each plant represents one of the seven people who worked tirelessly on the Accessibility Committee. 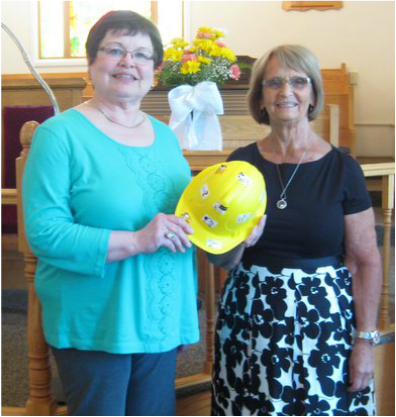 Dorothy Webster presents Sheila Penney with a special hard hat in recognition of the many hours of service she gave as chair of the Accessibility Committee.